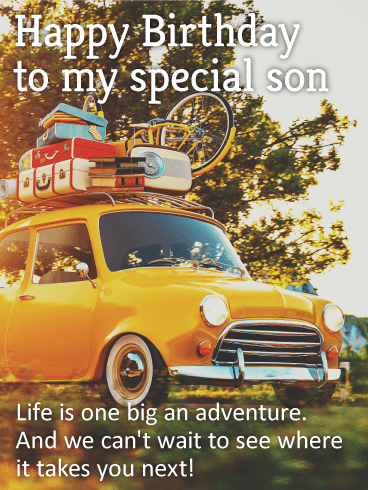 A stretch of open road ahead, with the sun warmly shining down, will let your special son know that the next year" hold endless possibilities" for him...starting with this important birthday celebration! Maybe he's starting a new career, or getting married, or becoming a dad for the first time. Whatever memorable milestones are awaiting him, he'll always have your love, support and encouragement, which are the best gifts of all. 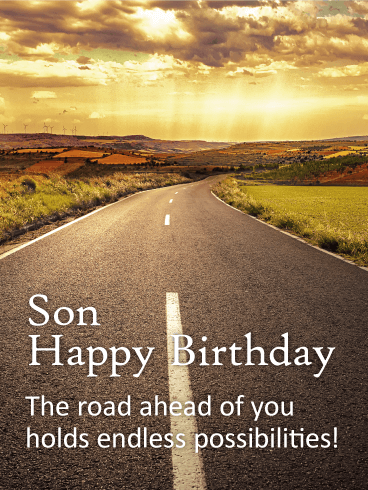 Son Happy Birthday - The road ahead of you holds endless possibilities! 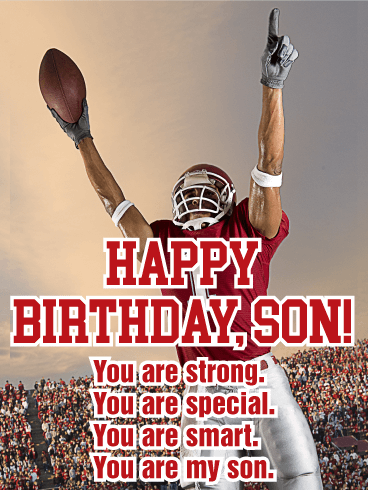 This birthday card is striking and strong and will make your son feel loved and supported when he receives it. The message is sentimental and sweet but also strong and prideful. The image of the successful football player celebrating is perfectly matched to the powerful message. 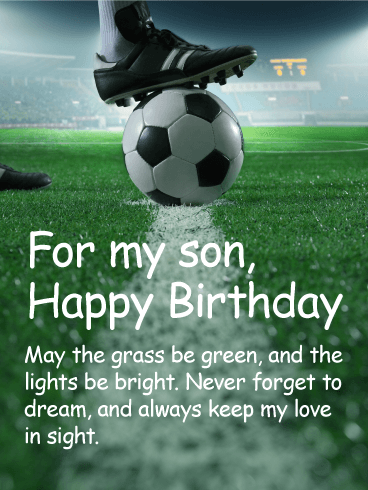 This birthday card is perfect for the football loving son in your life. 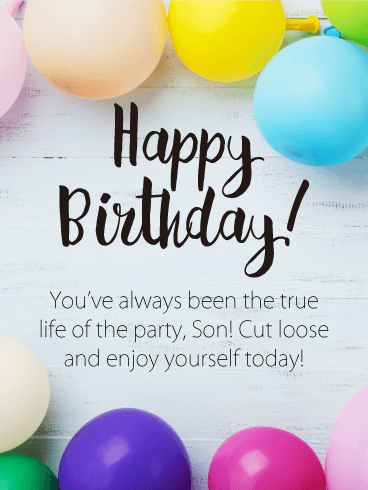 This birthday card is as fun and playful as your son. Your son is bound to laugh when they open this cute and adorable birthday card. It's simple message is perfect for any age and any relationship status. 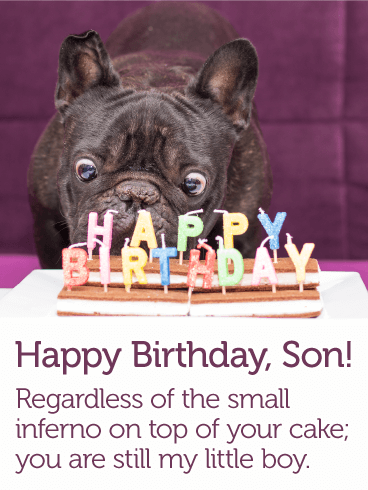 With a sweet and simple message you can say everything that needs to be said on your son's birthday. They will feel special and cared for when they receive this birthday card. 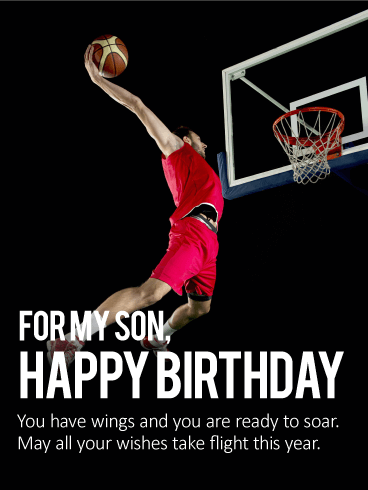 The sky's the limit for your son as he celebrates another year. That's the theme of this powerful birthday greeting! The image shows a special moment: reaching the highest peak of a mountain. 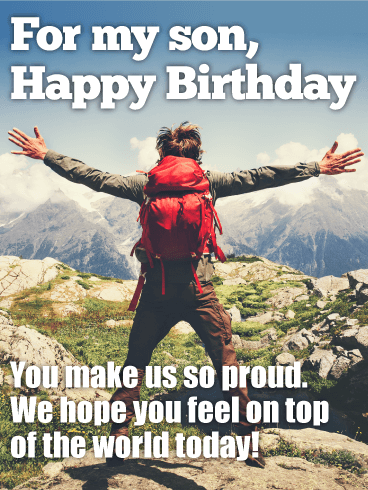 And certainly the climber in this birthday card feels just as proud as you do of your amazing son every day. What a wonderful way to remind him of how much he means to you, today and always. The car is packed up and ready to go. Where will this next year take him? That's the theme of this birthday card for your son. Maybe he's going off to college, maybe he's moving away or starting another important chapter of his life. One thing is for sure, as he heads off on his next adventure, he'll know that you are always thinking of him and wishing him well! 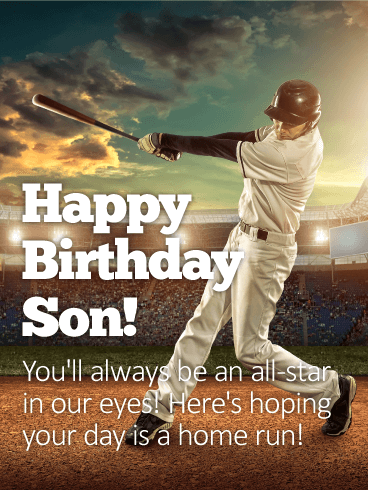 If your son loves baseball, this birthday card will have him feeling like a champ! The image of a player, taking a home run swing in front of a packed stadium provides a winning moment that will stay with him in the year ahead! The message adds to the inspirational tone of this greeting, letting him know that he'll always be #1 in your eyes and in your hearts. 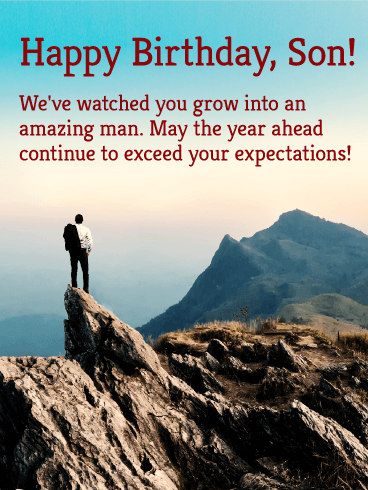 The son you've raised has "grown into an amazing man", and on his birthday, you want him to know of all the possibilities that lie ahead of him in the year ahead. This moving birthday card, with the image of a man appearing to be standing on top of the world, brings a very touching message: of hope, encouragement and most important of all, love. 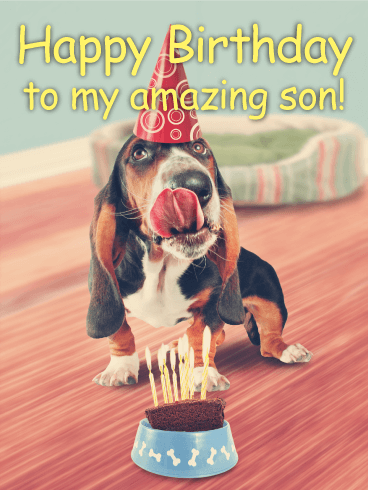 This cute and sweet birthday card is perfect for your son. It's funny and lighthearted but still sends the message that you love and support him. The adorable dog will surely bring a smile to his face and the sweet sentiment of the birthday card will warm his heart. He will feel loved, supported, and cherished. 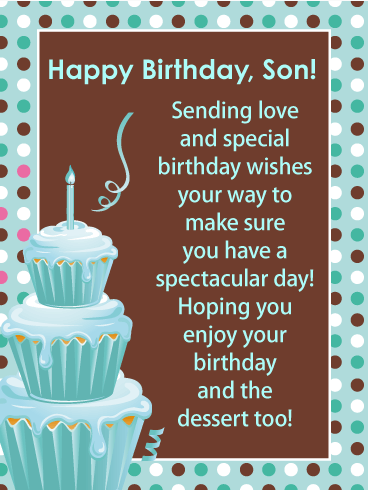 Send this birthday card to your son and see how much he appreciates your thoughtfulness and love. This birthday card screams happiness and excitement! What son does not want to feel their parent's excitement about their birthday? This birthday card does that for you. Your son will feel so loved and will know just how excited you are about their birthday. A champagne bottle with exploding confetti is the perfect visual demonstration of your happiness and love. 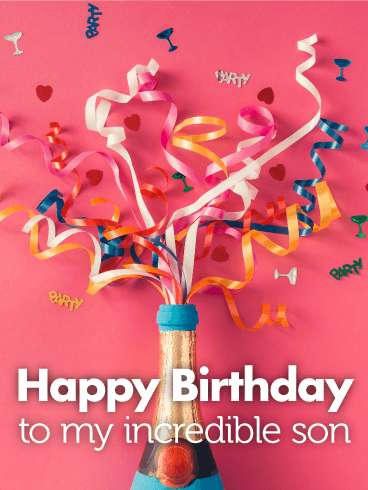 Let your son know just how excited you are and send this birthday card today! This is perfect birthday wish for any son. Your son will feel loved and supported when they read this birthday card. They will feel inspired and motivated. The beautiful and sentimental birthday card is perfectly matched to the sweet and sentimental wish of the card's message. If you want to send a card with a deeper than average message this is the birthday card for you.